The European Transport Workers’ Federation (ETF) attends the Maltese government’s first Malta Maritime Summit from 3 to 6 October. Malta wants to promote the island as a centre of maritime excellence in the Mediterranean and to reflect on the industry’s future in Europe engaging a wide range of stakeholders. In the context of the review of the EU shipping policy, high level speakers of both the industry and the EU Commission present their views on the challenges that lay ahead. 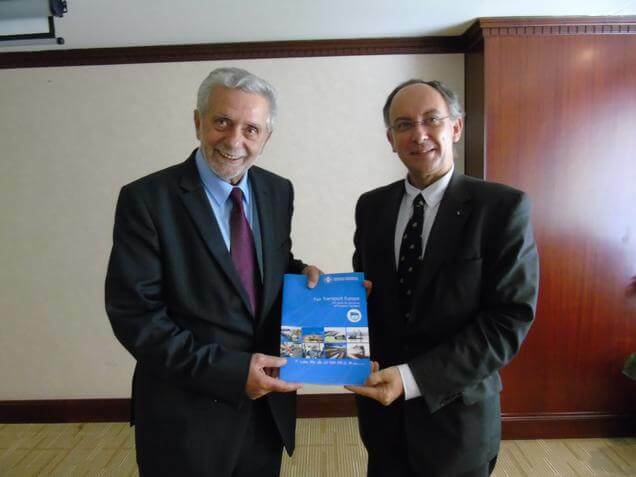 The ETF, represented by its General Secretary Eduardo Chagas and Political Secretary for Maritime Transport, Philippe Alfonso, take this opportunity to express ETF’s concerns and views to make tomorrow’s maritime transport sector a generator of wealth and EU-based jobs. Apart from bilateral meetings with Greek, Cypriot and Maltese transport ministers aimed at presenting both the ETF Fair Transport Europe Campaign and the Federation’s Manifesto on a social agenda for quality shipping in Europe, ETF participates actively in the Malta Maritime Summit’s round tables and side activities to ensure the human element receives the highly needed attention in the debate and that workers’ interests are not being overlooked when talking about future maritime policies. Philippe Alfonso participates in a debate on competitiveness and jobs, organised by the ECSA. Talking on the eve of this event, he stresses that “a solution must be found to balance competitiveness with the socio-economic need for more and better jobs at sea for European seafarers. The recruitment and retention of skilled European based seafarers is of paramount importance to avoid losing the capacity to operate a diverse merchant shipping fleet. I am glad Emanuele Grimaldi, Managing Director of the Grimaldi Group, is also sharing this approach and even referred to the possibility of using fiscal incentives to reward those shipping companies that are committed to take on European cadets for the completion of their maritime training and ease their entrance into the seafaring labour market”. The three-day event in Valetta brought together, amongst other speakers: Kitack Lim (IMO Secretary General), Marios Demetriades (Cypriote Minister of Transport), Fotis Karamitsos (Transport Director, EU Commission), Pete Hinchliffe (General Secretary International Chamber of Shipping -ICS), Patrick Verhoeven (Secretary general of the European Community Shipowners’ Association – ECSA), Markku Mylly (Executive Director European Maritime Safety Agency – EMSA), and Tineke Netelenbos (President Royal Dutch Shipowners’ Association).